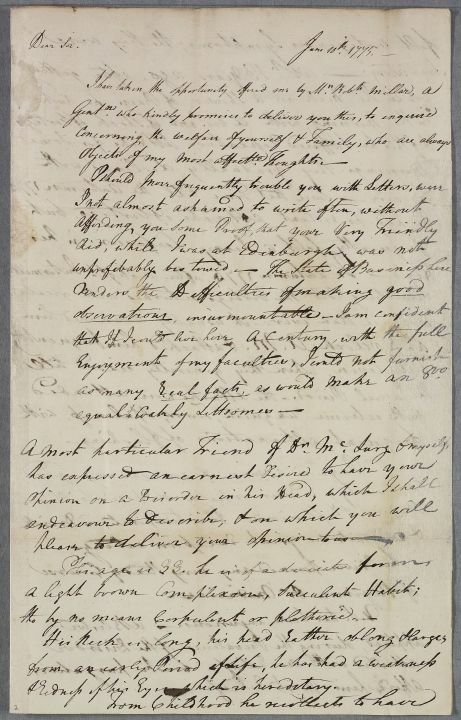 Letter from Cullen's former pupil in Virginia, Dr Walter Jones relating the case of Mr Page, 'a most particular Friend of Dr McLurg & myself', who has asked for Cullen's advice regarding 'a Disorder in his Head'. Must have been sent from Williamsburg, Virginia, where Jones and Dr McLurg both practiced at this date. 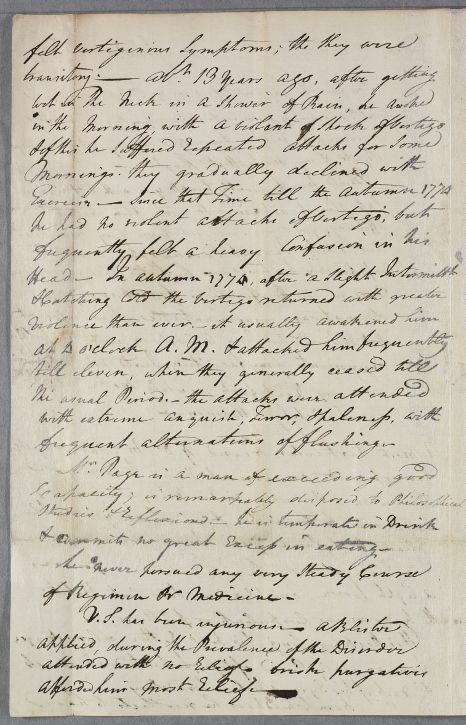 Summary Letter from Cullen's former pupil in Virginia, Dr Walter Jones relating the case of Mr Page, 'a most particular Friend of Dr McLurg & myself', who has asked for Cullen's advice regarding 'a Disorder in his Head'. 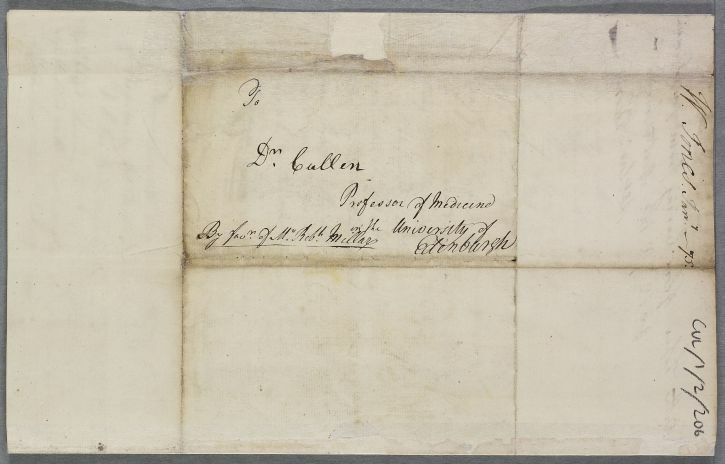 Must have been sent from Williamsburg, Virginia, where Jones and Dr McLurg both practiced at this date. 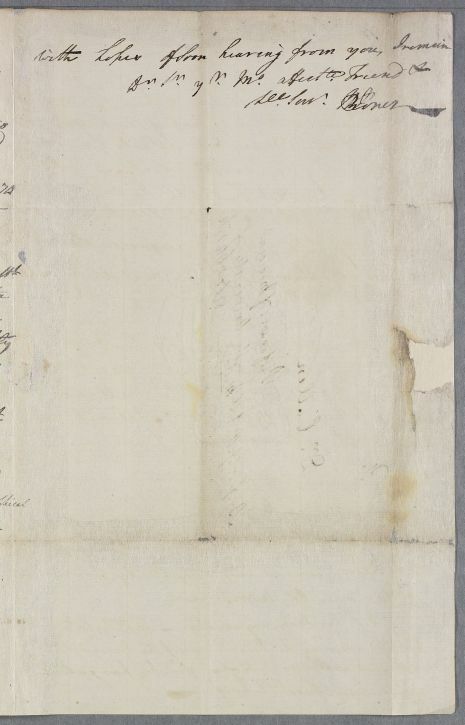 Case of Mr Page, resident in Virginia, who has a 'disorder in his head'. Objects of my most affectionate thoughts. tho by no means Corpulent or plethoric. & redness of his Eyes which is hereditary. W. Jones. January -- 75. Objects of my most affectte. thoughts. as many real facts as would make an 8vo. W. Jones. Jan.y -- 75.